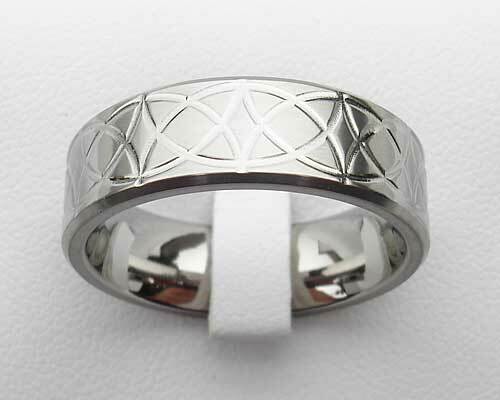 Men's Unique Celtic Titanium Ring : LOVE2HAVE in the UK! Here is our flat profile, unique men's titanium ring with an engraved Celtic half circles pattern that goes all the way around the ring. The repeated half circles pattern has an intersected arrangement that is very similar to a Celtic knot design. 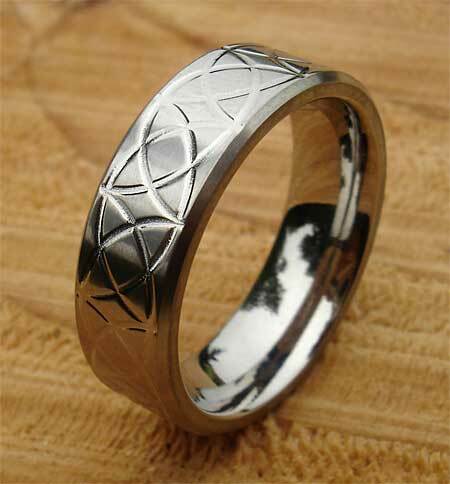 However, it has a far more subtle feel to it than the other Celtic rings as this style of engraved line work is slightly thinner and less pronounced. The delicate design catches the light very nicely indeed. It is shown here in a satin finish and has a chamfered edging. The ring measures 7mm wide. All in all a unique titanium ring with a simplistic design that would be suitable as a wedding ring for a man.